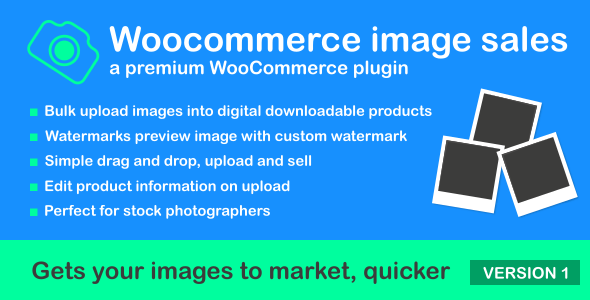 WooCommerce Image Sales was built to provide a better, quicker and easier way to turn your images into WooCommerce digital products. Are you a photographer and want to sell your images on your WooCommerce store. This tool is for you. It will do the heavy work. just set your presets (for example price) drag your images in and press start. your images are now for sale. This plugin has a simple drag and drop bulk image uploader and product editor. On Uploading of an image. This plugin will rename the image with a uniq id. This prevents the image from being stolen. the original image as the downloadable file and the watermarked version as the products thumbnail. Good news. This plugin will work with any theme that supports WooCommerce. how ? because its a backend tool only and does not change any front end feature.